There is no shortage of coffee shops in Stoke Newington. I counted at least 10, before settling on a café set at the back of a flower shop with a large peaceful courtyard garden. Away from the hustle and bustle, it seemed the perfect place to reflect – over a flat white and a piece of banana and chocolate cake – on the history of the area, before setting off on the final leg of my Capital Ring trail. Stoke Newington (or “new town in the wood”) grew around the Romans’ Ermine Street, part of which is now Stoke Newington High Street and then continues as Stamford Hill. In medieval times, it was a small village often visited by travellers heading north. And the manor of Stoke Newington was recorded in the Domesday Book of 1086 as being the property of the canons of St Paul’s cathedral. But there could have been a church on the site of The Old Church of St Mary earlier than that (it is possible that the land was a gift from King Athelstan in 940). Of course, the building – on the edge of Clissold Park – was constructed in a number different phases. The south aisle was built in 1563 by William Patten, the then Lord of the Manor, and in 1829 Sir Charles Barry enlarged the church. It suffered severe bomb damage during World War Two and restored to its current state in 1955. Stoke Newington began to attract many merchants following the arrival of the New River in the area in 1613 (described in my blog last week). 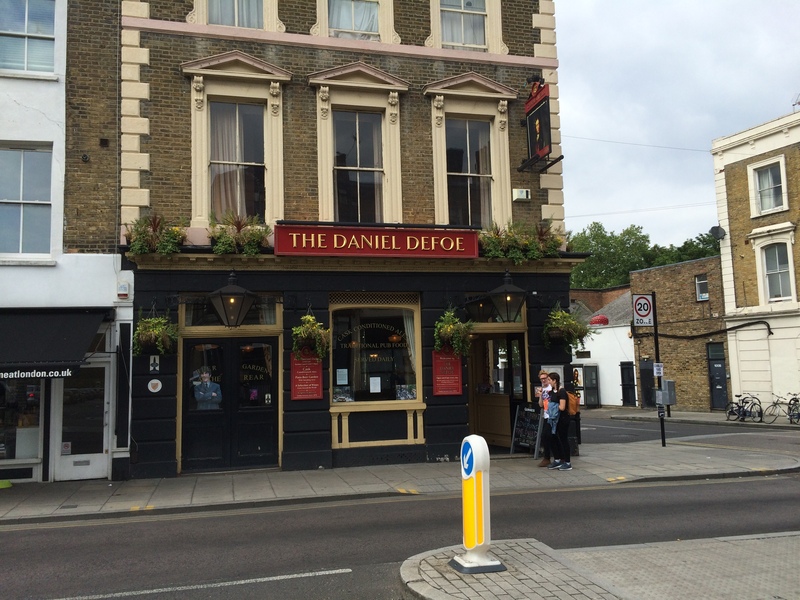 It became particularly popular with non-conformists, including author Daniel Defoe who at one stage lived on Stoke Newington Church Street. He is remembered through the name of a pub on Stoke Newington Church Street. The area was described at the beginning of the 19th century as a “misty looking village of England where there were a vast number of gigantic and gnarled trees,” according to writer Edgar Allan Poe. In the years that followed, the railway arrived and a wave of housing was built on farmland, which dramatically changed the area. It was then harder to consider Stoke Newington a separate village, distinctive from London (although some do still use that description today). With the rapid growth of the population, the existing church couldn’t accommodate all worshippers and so a new Church of St Mary’s was built in the 1850s opposite on the site of the old rectory and garden. Unusually for a parish, it was decided to keep both churches. Nearby, old Stoke Newington Town Hall (now merely an outpost of the main one in Hackney) is built on the site of Stoke Newington Manor House, which stood here from 1500 to 1695. But this history is overshadowed by the rapid gentrification that Stoke Newington has seen in recent years. The rapid influx of the trendy middle classes has brought its critics. When Clissold Park (which I visited on my last leg of the Capital Ring) refurbished its café, there was uproar because the menu was considered “too posh” and the operators were forced to introduce simpler items to menu, such as cheese and pickle sandwiches. Perhaps the positive thing to take from gentrification however is the absence of chain stores on Stoke Newington Church Street. This bustling stretch of independent stores – ranging from butchers and bakers to coffee shops and bars – stands in contrast to high streets elsewhere in London that look identical. 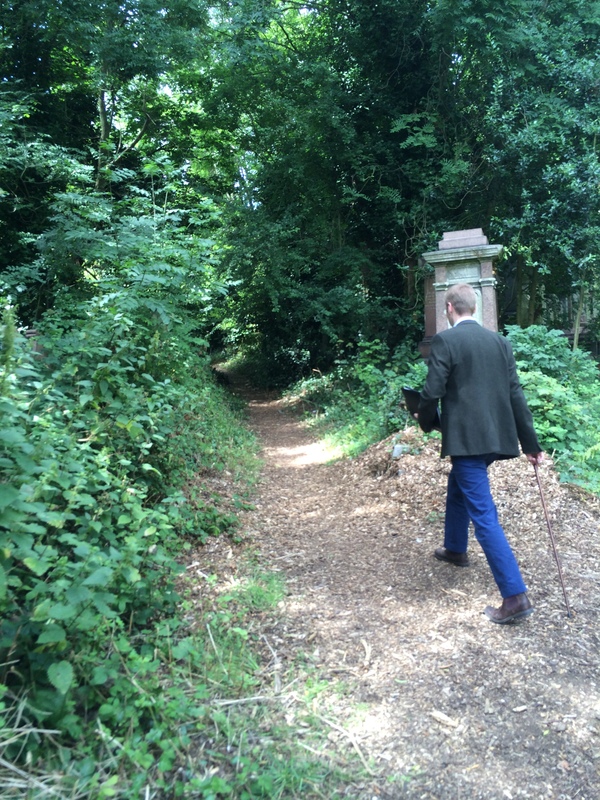 After I had finished my coffee I carried on along Stoke Newington Church Street and into Abney Park cemetery. Opened following the passing of a Bill in 1832 to encourage new private cemeteries to be established, it came at a time when London’s rapid population growth meant the inner city burial grounds became quite literally overflowing. Some 200,000 people are laid to rest here. 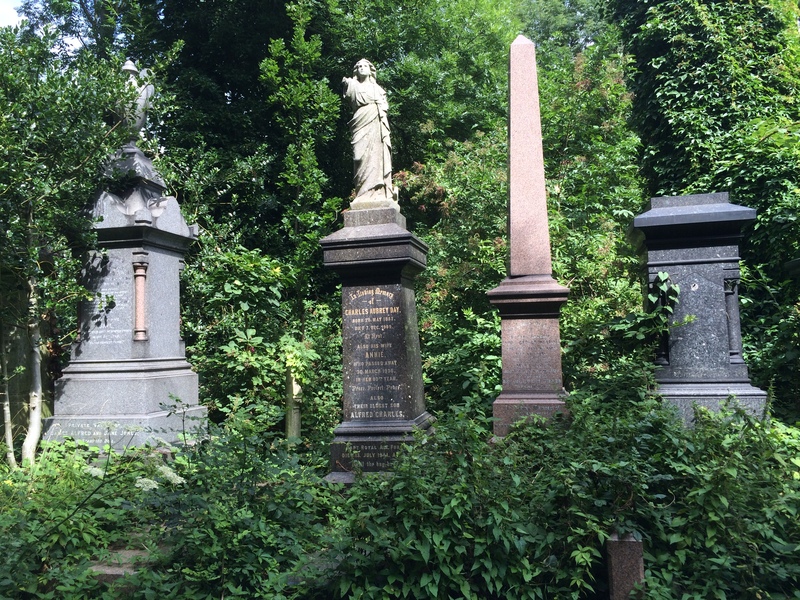 Abney Park had been the site for Fleetwood House, the home of renowned non-conformist Dr Isaac Watts and it therefore quickly became a popular burial ground for Dissenters. As I wandered around the bark chipping path and looked at memorials, I spotted where William Booth, who founded the Salvation Army is buried. The peaceful 30 acre cemetery, which has a disused Gothic chapel in its centre, was originally laid out as an Arboretum, so it is very leafy and it is today considered a nature reserve. I was lucky that my visit to Abney Park cemetery coincided with the monthly free Saturday morning guided walk given by The Music Hall Guild of Great Britain and America. Matthew Neil, the society’s enthusiastic chairman, showed us the memorials of some of the 25 people associated with the music hall movement that are buried at Abney. We – I was joined on the tour by members of a Goth meet-up group – followed him off the main path and saw the graves that the Guild has been renovating in recent years (the pristine white marble of these glimmer in contrast to many other memorials which have been neglected). Once we had reached the memorials – often hidden away behind trees and bushes –Mathew recounted the fascinating stories of how the stars of their day had in many cases undertaken rags to riches transformations and risen to the top of the country’s most popular music hall bills. We were also treated to a number of impromptu performances from him of the witty and topical songs they would have sung back in their day. And what emerged over the course of the tour were the parallels between Abney Park and music halls. When the cemetery was founded, the latter movement was very much in its infancy. Early music halls were founded by publicans who saw the waves of people moving into cities for work and consequentiality an opportunity to make some extra money by tagging a performance room on the back of their pubs. Unlike the lavish that venues that appeared later on in the 19th century, early music halls tended to be rough and ready places. The big change came following the 1874 amendment to the Management of Metropolis Act which put many smaller ones out of business because they couldn’t afford the costly modifications (requiring safety curtains and the installation of fixed seating for example) that the law required. The music halls that followed became more like what we now call theatres and started to be targeted at higher class patrons. 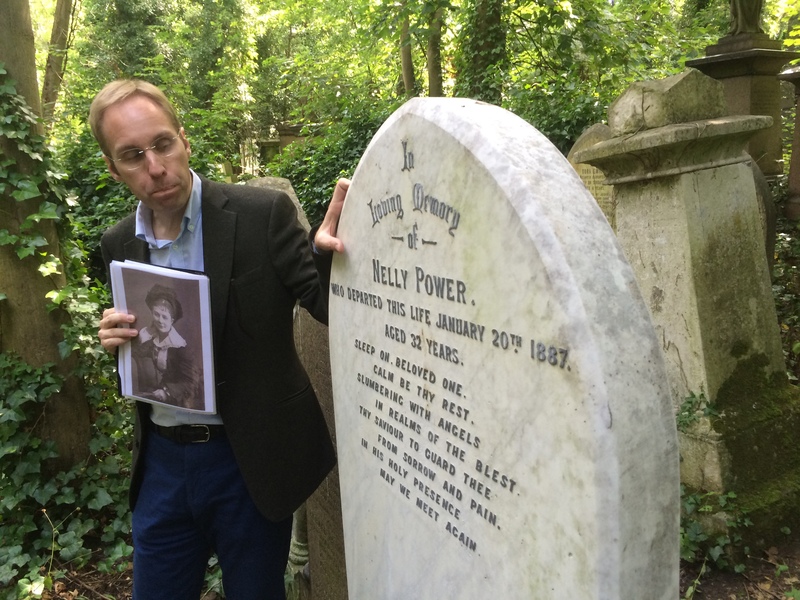 Walking around the peaceful grounds of Abney Park, we met numerous interesting characters from music hall history. People like JJ Poole, the manager of the 4,000 person capacity South London Palace music hall, who realised early on the importance of providing audiences with a variety of acts. Others, like Fred Albert, were performers who saw the transformation of music halls into a proper industry (the venues that he would have played in the 1860s would have been much more basic compared to those of 1886, the year he died). It was very noticeable how young an age many music performers died. Fred Albert was only 43 when he died, for example. Another George Leybourne – probably the first superstar of music halls on the back of the success of his hit song Champagne Charlie – was only 42 when he passed away in 1884. Leybourne had been an engineer who helped to build Brunel’s Great Western Railway and performed in provincial venues in the evenings. After moving to London he struck gold with a song that everyone was singing just days after he first performed it. The hectic lifestyle that he lived in the capital can only of contributed to his early death. His manager insisted on the star drinking champagne at his expense and he travelled by lavish coach as he went from venue to venue. But generally speaking it was tough being a music hall performer, according our guide. Many started in regional touring troupe that would spend a week performing in one town or city before spending Sunday moving on somewhere else – yet their next destination could be at the other end of the country. They had to accept to accept this punishing schedule because without work they quite simply wouldn’t eat. Abney Park went bankrupt in the 1970s and was bought by Hackney Council for £1. The authority gave control of the cemetery to independent trustees in the 1990s who invested considerable time and energy in clearing it and making the grounds a pleasant place to visit, but this year took back control of it. As for music halls, they started dying out following the First World War and have largely disappeared through extensive development of Britain’s towns and cities. I’ve visited a few of the few surviving buildings before (including Wilton’s in Whitechapel). But it’s good to see that the memories of stars are being kept alive through initiatives like the excellent tours at Abney Park. From the centre of Stoke Newton, I had some fairly uninteresting residential streets to walk down. Perhaps, the only meaningful observation is how the quality of the housing stock drops as you cross the A10 (Stoke Newington High Street and Stamford Hill). Thankfully I soon arrived at Springfield Park, which opened to the public in 1905. Like many parks in London, it boast a café, playground, lake, tennis courts, bowling green and it slopes down to the River Lea. 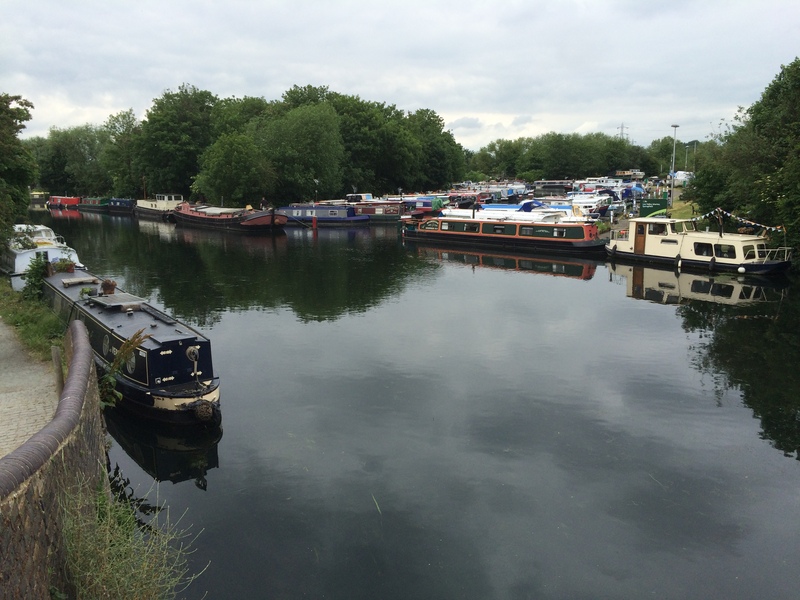 I followed the river for three miles to Hackney Wick and found it much busier than other stretches of water that I had encountered on previous legs of the Capital Ring. The bit I walked along was lined with barges along its banks and many residents were out having parties – some had music blasting out of speakers – on their decks or on the edge of the gravelled towpath used by walkers and cyclists. Intriguingly, there was one boat that billed itself as a floating community centre. Judging by the jovial conversations people were having from one vessel to the next there definitely seemed a strong sense of cohesiveness here. Some of the land neighbouring the river is quite wild including a considerable expanse of marsh and the Middlesex Filter Beds. The latter was built by East London Waterworks Company in 1852 to remove impurities from the River Lea. They went out of use in 1969 and in recent decades have been established as a nature reserve, attracting a wide range of plants, birds and other wildlife. There are also numerous blocks of new apartments (and more are being built) enjoying a pleasant position overlooking the water and Hackney Marshes – known as the home of English “Sunday Football” and included in the Guinness Book of Records for the having the largest collection of football pitches (more than 80) in the world. Some 78 miles after setting off on my hike around the outskirts of London, I was back at the point where my adventure had begun. Along the way I had experienced some wonderful parks, forests, meadows, waterways. I had eaten some wonderful food and drank numerous well-made coffees. I had said hello to numerous friendly people. But for someone who loves history, I had also experienced countless interesting heritage sites along the route. From ancient woodland and the homes of medieval kings to traces of our industrial past and discovering more modern times, it really had been an enriching experience. Arriving back in Hackney Wick, my walk had come full circle in more ways than one. This former industrial area is being transformed by hipsters enjoying the open air riverside bars, places that were bustling when I reached this spot on an early summer’s evening. How will Hackney Wick – and London in general – change again in the years to come? That’s a difficult question to answer. To get a deep insight into how London life is continuing to be transformed, I could do worse than walking the Capital Ring all over again.